Class 11th Biology Chapter 10 Cell Cycle and Cell Division NCERT Solution is given below. Question 1: What is the average cell cycle span for a mammalian cell? Answer The average cell cycle span for a mammalian cell is approximately 24 hours. Question 2: Distinguish cytokinesis from karyokinesis. Question 3: Describe the events taking place during interphase. Answer Interphase involves a series of changes that prepare a cell for division. It is the period during which the cell experiences growth and DNA replication in an orderly manner. Interphase is divided into three phases. G1 phase – It is the stage during which the cell grows and prepares its DNA for replication. In this phase, the cell is metabolically active. 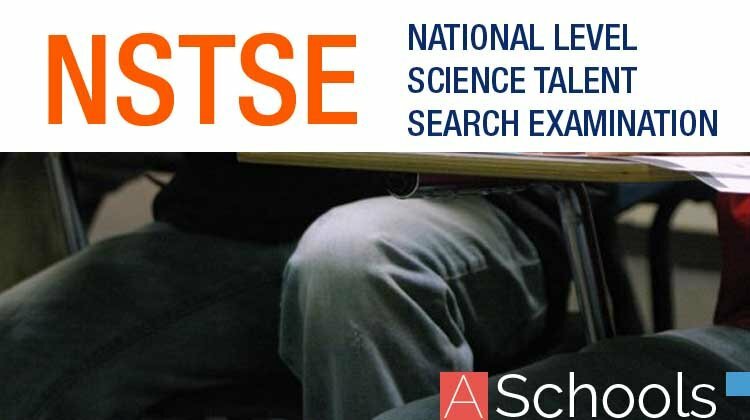 S phase – It is the stage during which DNA synthesis occurs. In this phase, the amount of DNA (per cell) doubles, but the chromosome number remains the same. 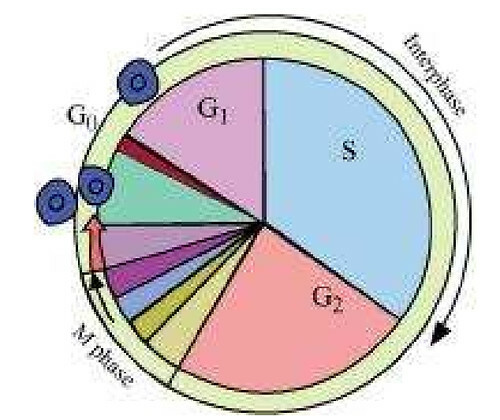 G2 phase – In this phase, the cell continues to grow and prepares itself for division. The proteins and RNA required for mitosis are synthesised during this stage. Question 4: What is G0 (quiescent phase) of cell cycle? Answer G0 or quiescent phase is the stage wherein cells remain metabolically active, but do not proliferate unless called to do so. Such cells are used for replacing the cells lost during injury. 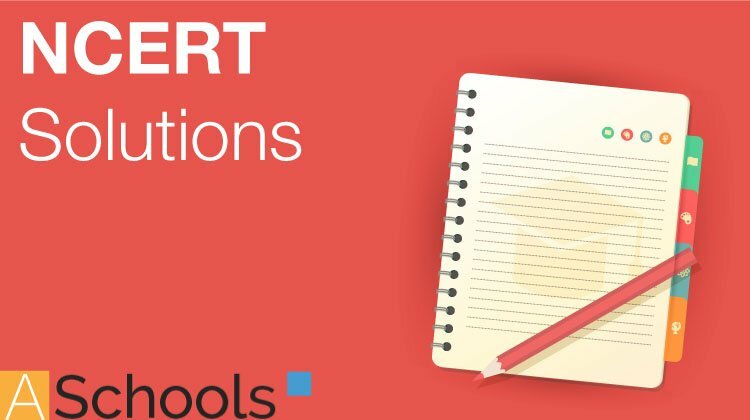 Question 5: Why is mitosis called equational division? Answer Mitosis is the process of cell division wherein the chromosomes replicate and get equally distributed into two daughter cells. The chromosome number in each daughter cell is equal to that in the parent cell, i.e., diploid. Hence, mitosis is known as equational division. (a) synapsis (b) bivalent (c) chiasmata Draw a diagram to illustrate your answer. 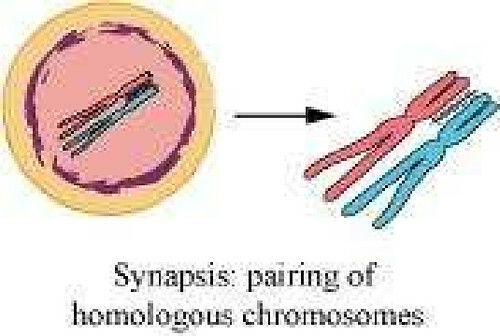 The pairing of homologous chromosomes is called synapsis. This occurs during the second stage of prophase I or zygotene. Bivalent or tetrad is a pair of synapsed homologous chromosomes. They are formed during the zygotene stage of prophase I of meiosis. Chiasmata is the site where two sister chromatids have crossed over. It represents the site of cross-over. It is formed during the diplotene stage of prophase I of meiosis. Question 8: How does cytokinesis in plant cells differ from that in animal cells? Question 9: Find examples where the four daughter cells from meiosis are equal in size and where they are found unequal in size. Answer (a) Spermatogenesis or the formation of sperms in human beings occurs by the process of meiosis. It results in the formation of four equal-sized daughter cells. (b) Oogenesis or the formation of ovum in human beings occurs by the process of meiosis. It results in the formation of four daughter cells which are unequal in size. Question 10: Distinguish anaphase of mitosis from anaphase I of meiosis. 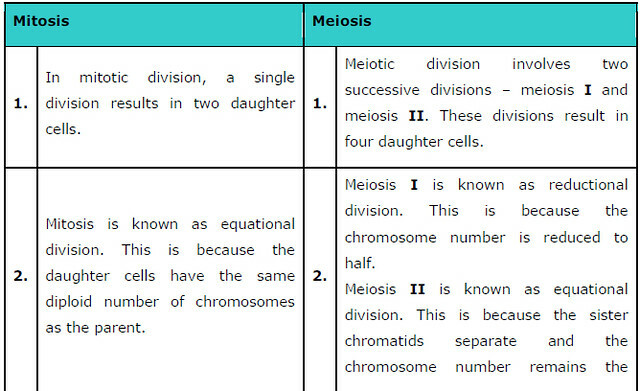 Question 11: List the main differences between mitosis and meiosis. Question 12:What is the significance of meiosis? 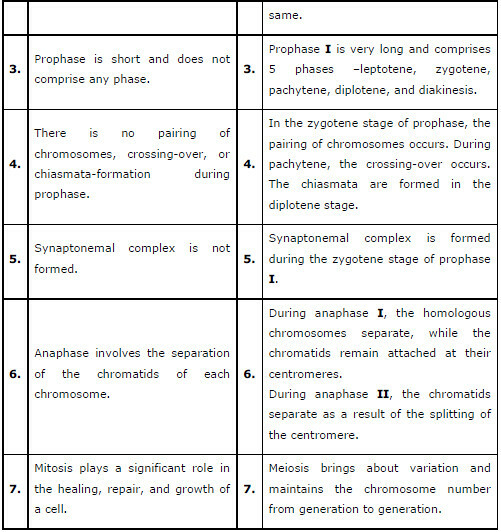 Answer Meiosis is the process involving the reduction in the amount of genetic material. It comprises two successive nuclear and cell divisions, with a single cycle of DNA replication. As a result, at the end of meiosis II, four haploid cells are formed. 1. Meiosis maintains the chromosome number from generation to generation. It reduces the chromosome number to half so that the process of fertilisation restores the original number in the zygote. 2. 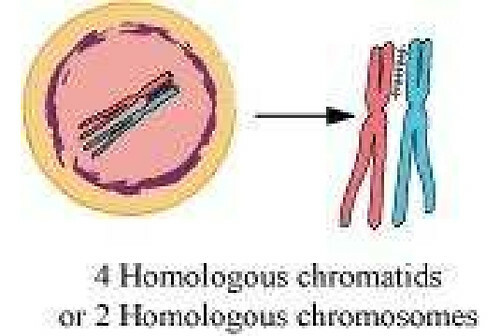 Variations are caused by the cross-over and the random distribution of homologous chromosomes between daughter cells. Variations play an important role in evolution. 3. Chromosomal mutations are brought about by the introduction of certain abnormalities. These chromosomal mutations may be advantageous for an individual. (ii) some haploid cells in higher plants where cell-division does not occur. Answer (i) In some insects and lower plants, fertilization is immediately followed by zygotic meiosis, which leads to the production of haploid organisms. This type of life cycle is known as haplontic life cycle. (ii) The phenomenon of polyploidy can be observed in some haploid cells in higher plants in which cell division does not occur. Polyploidy is a state in which cells contain multiple pairs of chromosomes than the basic set. Polyploidy can be artificially induced in plants by applying colichine to cell culture. Question 14: Can there be mitosis without DNA replication in S phase? division. Therefore, the duplication of DNA is an important step. Question 15: Can there be DNA replication without cell division? Answer There can be DNA replication without cell division. During cell division, the parent cell gets divided into two daughter cells. However, if there is a repeated replication of DNA without any cell division, then this DNA will keep accumulating inside the cell. This would increase the volume of the cell nucleus, thereby causing cell expansion. An example of DNA duplication without cell division is commonly observed in the salivary glands of Drosophila. The chromosome undergoing repeated DNA duplication is known as polytene chromosome. Answer During meiosis, the number of chromosomes and the amount of DNA in a cell change. start moving toward their respective poles. As a result, the bivalents get divided into two sister chromatids and receive half the chromosomes present in the parent cell. Therefore, the number of chromosomes reduces in anaphase I. 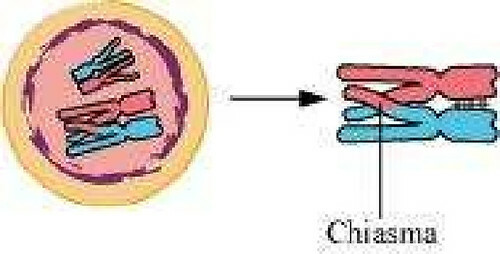 (ii) Amount of DNA content (C) per cell During anaphase II of the meiotic cycle, the chromatids separate as a result of the splitting of the centromere. It is the centromere that holds together the sister chromatids of each chromosome. As a result, the chromatids move toward their respective poles. Therefore, at each pole, a haploid number of chromosomes and a haploid amount of DNA are present. During mitosis, the number of chromosomes remains the same. The DNA duplicated in the S phase gets separated in the two daughter cells during anaphase. As a result, the DNA content (C) of the two newly-formed daughter cells remains the same.